Introduction/purpose Determining the appropriate device length for flow diverter placement or stent assisted coiling can be limited by inaccurate vessel length spline measurement on typical 3D workstations especially in the setting of marked vessel tortuosity, overlying structures, and large aneurysm size. Echopixel software allows the user to more accurately select the intended structure of interest for measurement with true 3D visualization and active feedback. Early experience with the Echopixel True 3D Viewer appears to provide more reliable vessel length measurements in this setting. Materials and methods Two separate patient data sets were utilized to measure the internal carotid artery length from the normal vessel beyond an intracranial aneurysm to the horizontal cavernous segment on both the Siemens Leonardo 3D Workstation and the Echopixel True 3D Viewer utilizing the spline function. Measurements were repeated 10 times on each workstation for each data set. The first patient data set included measurements from the anterior choroidal artery level to the proximal horizontal cavernous segment of the internal carotid artery with limited underlying tortuosity and a small aneurysm. The second patient data set included measurements from just distal to the anterior choroidal artery origin to the mid horizontal cavernous segment of the internal carotid artery with marked underlying tortuosity, overlapping vascular structures and a large adjacent aneurysm. Results Measurements from the first patient data set demonstrated a mean of 31.0 mm on Echopixel with a range of 30.68 mm to 31.62 mm. The mean on Leonardo was 30.9 mm with a range of 30.0 mm to 33.4 mm. Measurements on the second patient data set demonstrated a mean of 33.7 mm on Echopixel with a range of 32.5 mm to 34.5 mm. The mean on Leonardo was 44.9 mm with a range of 35.0 mm to 101.3 mm. Conclusion Both the measurements taken on the Echopixel True 3D Viewer and the Siemens Leonardo 3D Workstation were reproducible with excellent accuracy when evaluating an internal carotid artery with limited tortuosity, minimal overlying structures and a small aneurysm. 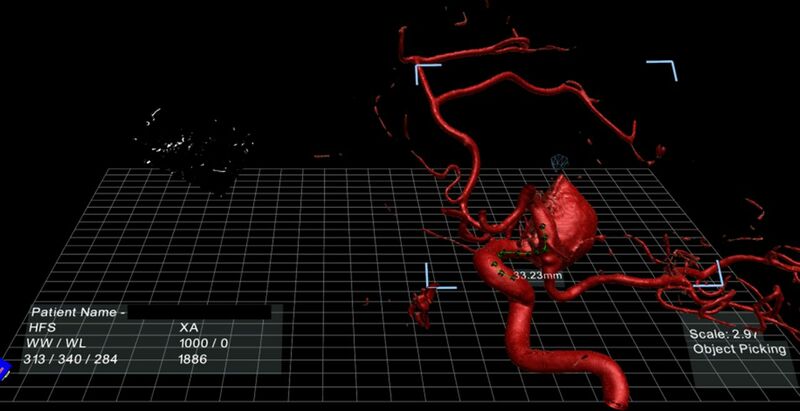 When marked tortuosity, overlying vascular structures, and larger aneurysms are present, the Leonardo workstation will occasionally select unintended structures as the point to be measured, resulting in markedly inaccurate assessment of vessel length. Echopixel allows the user to view the precise points where the measurements are being placed in 3D with on screen and haptic feedback. This improved reproducibility/accuracy may be beneficial in selecting an appropriately sized device. Disclosures I. Kaminsky: None. M. Adix: None. I. Choi: 2; C; Codman.